Common brown lemurs browse on a wide variety of fruit, leaves, buds, and flowers, depending on the season. In the northwest, they eat cicadas and perhaps the occasional bird and eggs. Active during the day (diurnal), common brown lemurs also move and feed at night during the dry season. Sociable animals, they live in groups averaging 3-12 individuals, with none of the female dominance seen in other lemur species. 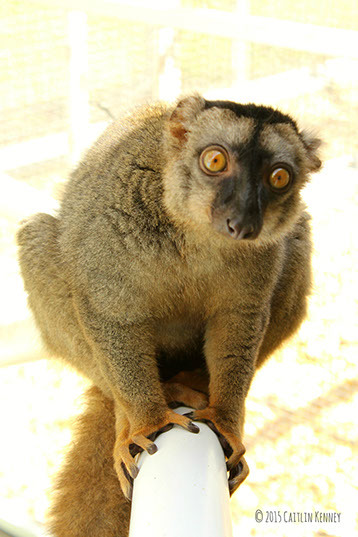 In Madagascar, common brown lemurs reach sexual maturity at around 18 months and breed in May and June. Females give birth, usually to a single infant, about 120 days later. Natural predators include hawks, boa constrictors, and fossae (the plural for fossa—a large, carnivorous mammal, related to the mongoose with qualities of a cat). Slash-and-burn agriculture and hunting are destroying their habitat.